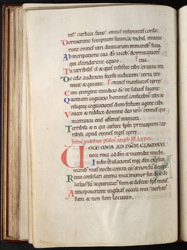 St. Decuman, a saint who appears relatively rarely in manuscripts, occurs in the Litany of this manuscript, and it is probably on that basis that it has been attributed to Muchelney (a few miles from Langport, in Somerset). Decuman is absent from the calendar, however, and other entries (such as an emphasis on St. Cuthbert) suggest an origin in the north of England. Run-over symbols on this page include the heads of a human, bird, and animal, and foliate motifs.